Purling In Anger: Arrest Breaks Up 'Knit-In' At Vermont Utility : The Two-Way Five police cars responded to perhaps the most civil of all disobediences: five women knitting at a gas company's headquarters. 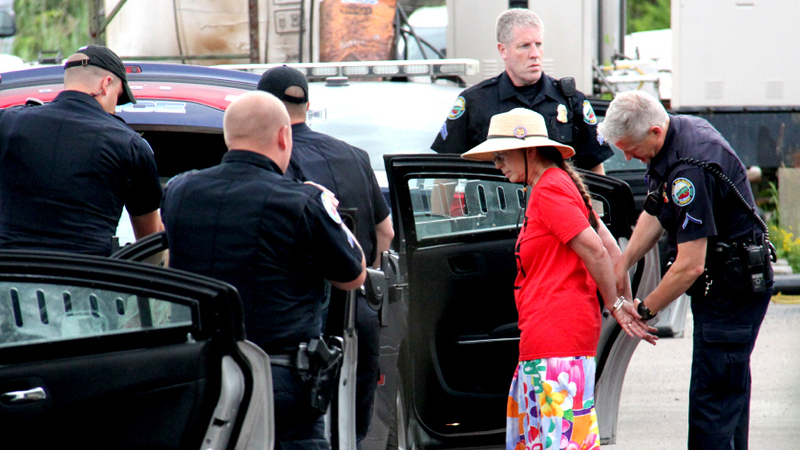 Jane Palmer of Monkton, Vt., was arrested after refusing to leave the Vermont Gas Systems headquarters in South Burlington on Wednesday. She and four other women were knitting in protest of a planned pipeline. A "knit-in" was broken up in South Burlington on Wednesday, after five women who are unhappy with a Vermont Gas pipeline plan occupied the utility's waiting room — and occupied themselves by knitting. One woman was bound off by police, taken away in what Vermont Public Radio says were five squad cars that responded to perhaps the most civil of all disobediences. The knitters insisted on speaking to Vermont Gas officials about their complaints over a pipeline expansion along their land. They were told they needed an appointment; after the utility's headquarters closed, they were warned that they were trespassing. Jane Palmer, a diminutive woman in a floral-print dress and a straw hat, was arrested about 30 minutes after the offices closed. "Palmer was knitting what appeared to be a turquoise scarf, and had knitted about 8 inches of it before Vermont Gas closed at 5 p.m.," VPR's Taylor Dobbs reports. "It is unclear if she was allowed to continue her knitting at the police station," he adds. As Vermont Public Radio reports, Palmer and other protesters say pipeline workers "have entered their property without permission and misled the public about the company's intentions." Before she was arrested, Palmer told Dobbs that she and her husband had researched the pipeline permitting process, and they're convinced it's not being handled properly in their case. But no one has listened to her complaints, she said. "I was incensed because I feel like they're trying to intimidate and bully people into not protesting," Palmer said, "if you think you're gonna have a record and you're going to have to go to jail or whatever. Law-abiding citizens do not like to be threatened with being arrested." She told Dobbs that this was the first time she'd ever been arrested. Reached by the Burlington Free Press, she said she's scheduled to appear in court in two weeks. Update: Since this post was first published, we've added more details about Palmer and the other protesters' claims, and clarified that they live along the pipeline expansion's path.